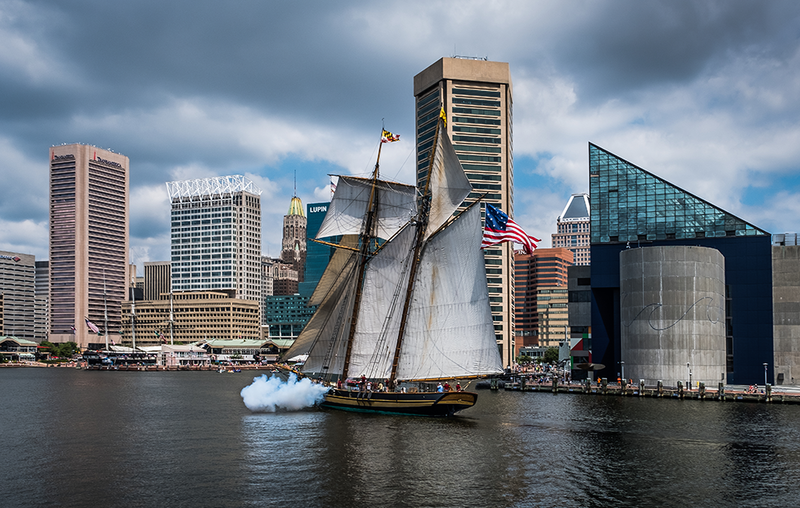 In 1975, the City of Baltimore adopted a proposal for the construction of a replica sailing vessel as the centerpiece of its Inner Harbor revitalization efforts. An iconic clipper ship was chosen because of the pivotal role Baltimore privateer vessels played in the War of 1812. Pride of Baltimore, the first Baltimore Clipper to be built in 150 years, and the first tall ship to represent a city and a state, was commissioned on May 1, 1977, in a ceremony at the Inner Harbor attended by thousands. During her nine years at sea, between her maiden voyage to Bermuda, New York, and Nova Scotia in 1977, to her final European voyage in 1986, Pride of Baltimore extended the hand of friendship to countless visitors. Altogether, she logged more than 150,000 nautical miles, equal to six times around the globe. She sailed further in nine years than most sailing vessels travel in their lifetimes. On May 14, 1986, on her way home from a successful European campaign, Pride of Baltimore was struck by a microburst squall north of Puerto Rico. Within minutes, the schooner sank; the ship, her captain, and three crew members were lost at sea. After the tragic sinking of Pride of Baltimore, an outpouring of unsolicited public support all but forced Pride of Baltimore, Inc. into going forward with a new ship. By late summer of 1986, plans for a replacement were under way. The ship was to be named Pride of Baltimore II and serve as a sailing memorial to the original Pride. Pride of Baltimore II was hoisted aloft and launched from her Inner Harbor birthplace on April 30, 1988. After being fitted out and rigged, she was commissioned on October 23, 1988, at Brown’s Wharf in Fells Point, just blocks from the shipyard where Chasseur, the original “Pride of Baltimore,” had been built in 1812. Since her commissioning, Pride II has sailed over 250,000 nautical miles and visited more than 200 ports in 40 countries in North, South, and Central America; Europe; and Asia. Each season the vessel visits dozens of ports of call, and welcomes aboard over 100,000 people for private sailing charters and dockside receptions; deck tours and day sails; youth programs; and overnight guest crew experiences.